Built using emojis from here, here, and here. View available commands and options here. and selecting the Slash Commands option. Note: Table flipping will not work without one of these specific slash commands. Check the box next to Show this command in the autocomplete list. Set the Description field to "Flip some tables". Set the Usage hint field to "[type] (or 'help', 'list')". Set the Descriptive Label field to "EM Slack Tableflip". And finally, click the Save Integration button. Check out the usage section to get started flipping! Note: These examples use /tableflip but yours may vary based on what you selected for step 2 during a manual setup. Use command /tableflip help to view this usage information from within Slack. Note: The word input is optional and will display the flip with the provided word. Not all flip types can do word flips. Without a word, the flip will display the standard table. 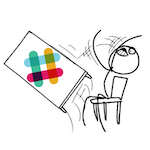 Use command /tableflip list to view this list from within Slack.